[SECESSION]. SOUTH CAROLINA COMMITTEE ON THE CONSTITUTION. Printed Document, “An Ordinance To amend the Constitution of the State of South Carolina, in respect to the Executive Department,” Charleston, South Carolina, [ca December 24, 1860]. 2 pp., 8¼ x 13¾ in. A thirteen-member Committee on the Constitution of the State considered a variety of issues related to severing the state from the federal union. 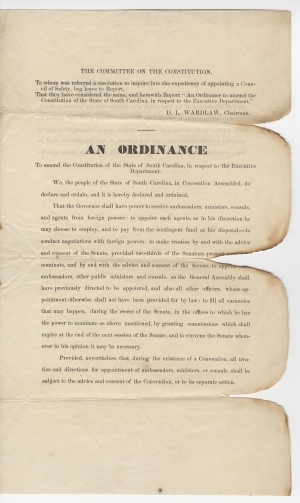 After deliberation, Chairman David L. Wardlaw (1799-1873) reported this proposed ordinance, which the convention debated and passed on December 27. It gave the governor of South Carolina broad power to conduct foreign relations and created an Executive Council to advise him. This ordinance was in effect for only a short time until the formation of the Confederacy with its own constitution and laws. South Carolina ratified the Confederate Constitution on April 3, 1861, and passed its own new Constitution on April 8. That same day, the Convention repealed the first section of this ordinance and altered the second to dismiss the Executive Council except for the lieutenant governor and another member who would lead the Treasury Department. 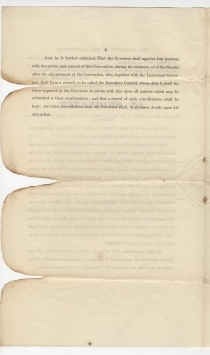 Fire damage and loss to right edge along folds, with minor text loss. A 160-acre fire in Charleston in December 1861 damaged more than six hundred buildings. Unlisted in T. Michael Parrish and Robert M. Willingham Jr.’s Confederate Imprints: A Bibliography of Southern Publications from Secession to Surrender (1984). Very rare. Ordinances and Constitution of the State of South Carolina, with the Constitution of the Provisional Government and of the Confederate States of America (Charleston, SC: Evans & Cogswell, 1861), 32.